The Tiber (Latin: Tiberis; Tevere) has been a so-called identifying mark of Rome since the days of the Great Empire. 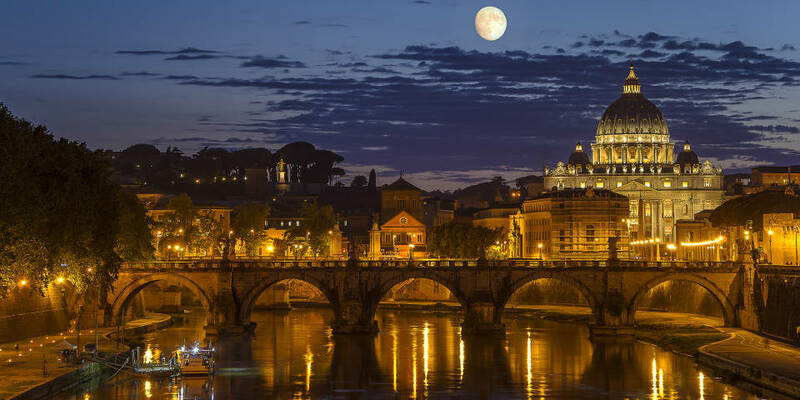 A meandering river surrounds famous hills of the Italian capital, lovingly skirting the silhouette of Trastevere. Glistening mirror of the river is surrounded by many landmarks of ancient and medieval architecture. 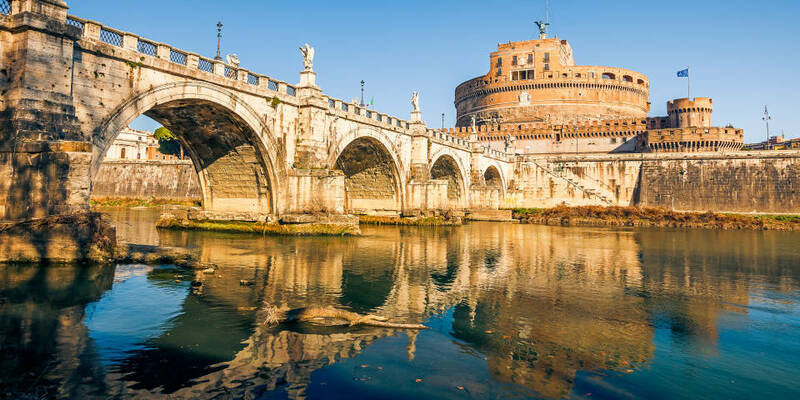 Dozens of bridges connect the left and right banks of the Tiber, making Roman landscapes so beautiful and romantic. The Tiber flows out of the Apennine Mountains slopes in Emilia-Romagna. Full-flowing mountain river runs through Umbria and Lazio, on its way to Rome, being joined by the rivers Nera and Aniene. 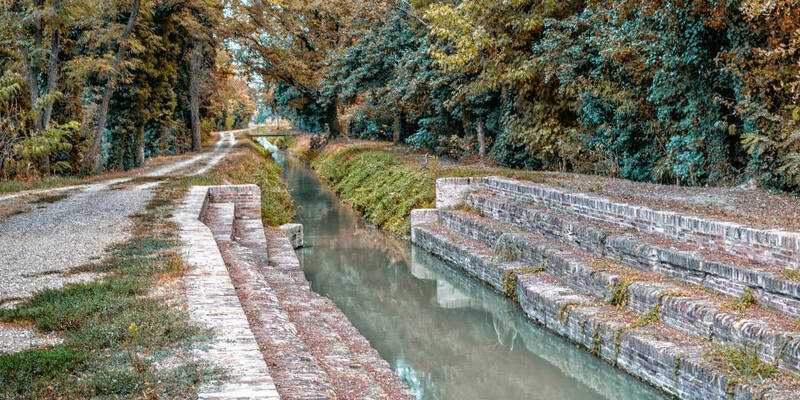 Before Rome it is flanked by concrete fortifications and the watercourse itself is changing into the channel Fossa Traiani across the capital. The endpoint of the Tiber is the Tyrrhenian Sea (Italian: Mar Tirreno). The total length of the third longest river in Italy is 406 km (252 mi) and the basin is 17,375 square kilometres (6,709 sq mi). The river is the most important source of water supply for Rome. Italians often call the Tiber “flavus”, which means “white” from Latin. This nickname is used because of the yellow-whitish color of the water. There are several suggestions about the origin of the name “Tiber”. 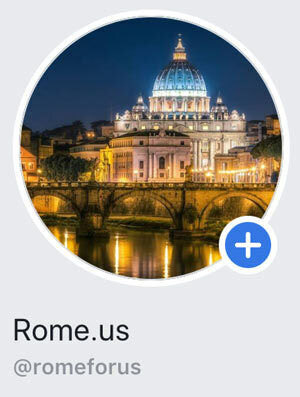 According to one of them, “Tiber” has pre-Latin origin, deriving from the noun “Tibur” – an ancient name of the town of Tivoli, located 30 km away from Rome. Also, the name of the river was mentioned in the writings of the Etruscans, being called “Tiferios”, which could be adopted and transformed by the Italians into “Tiber”. However, there is a legend in the biography of the famous river. King Tiberinus, who lived in the 900’s BC, was drowned in the river Albula, which later became known as Tiberius. Jupiter made the dead king a guardian of stormy waters, called Volturnus. It is believed, that due to this ancient myth, sculptors began to depict rivers, seas and oceans in the form of mighty men. It was the Tiber, where, according to the legend, newborn Romulus and Remus, the founders of Rome, were to be drowned. Historians believe that Rome was founded in 753 BC on the banks of the river Tiber about 25 km (16 mi) from the coast of Ostia. In ancient times, the river served as a border between the Etruscans, located to the west, the Sabines – to the east and Latins – to the south. The river played a significant role for the Romans, who built its economy due to the movement of merchant ships. Traders brought provisions, building materials and other goods to the capital. During the Punic Wars in the 3rd century BC port of Ostia was crucial for sea battles. Thus, the Tiber became also a strategic dominance in the hostilities of Rome. Later, a spacious berth was built along the coast of the river near the Campus Martius area. After the arrangement of the Roman central sewer system, Cloaca Maxima, the Tiber became an important part of it, delivering clean water to the city center through underground tunnels and pipes. Over time, the river became shallow, the capital port and maritime trade moved to Rome’s neighbor – Fiumicino. In the 17-18th centuries pontificate had made a lot of effort to clean the bed of the water body in Rome. Thus, the ecology of the Tiber was improved, however, nothing has been changed in river transportation, since it lost its former significance. The Tiber flows out of two mountain springs, located at an altitude of 1268 meters (4160,1 ft) above sea level. In 1930, Benito Mussolini has established the ancient marble column at the source of the river. The Latin words “Here is born the river / sacred to the destinies of Rome” are engraved on the obelisk. One of the river’s features is regular flooding. Thus, the Campus Martius area often used to plunge underwater up to 2 meters (6, 6 ft). Since 1876, when the city authorities built high stone fences on both banks of the Tiber, Romans have been reasonably safe. Another interesting fact is associated with the name of the river: a set expression “to cross the Tiber” means to become a Catholic convert. Analogously, “to cross the Thames” means to be converted into Anglicism. In times of religions’ war, such idioms were of great importance. In ancient Roman times, public execution was carried out by drowning criminals in the Tiber. In the reign of Tiberius, convicts were taken to Scale Gemonie and then pushed into the deep water. Such unenviable fate could occur to ordinary robbers as well as to the first Christian pontiffs. The Romans love to revive themselves by swimming in cold water. On the 1st of January, courageous, even desperate residents of the capital, accompanied by the rollicking hooting of the crowd, jump from Ponte Cavour into the Tiber! The quay is a perfect place for morning and evening jogs and bike tours. Left and right banks of the Tiber connect 26 bridges on the territory of Rome. Along with the new bridges, a few of the old ones have successfully survived. The Milvian bridge (Italian: Ponte Molle or Ponte Milvio) was founded in the 1st century BC to prolong the Via Flaminia (an ancient Roman road) and to connect Rome with Ariminum (modern Rimini). In the 4th century AD, the Mulvian bridge was a place for a tremendous battle of two emperors, Maxentius and Constantine the Great (Latin: Constantinus). It was not a battle for power, but for the dominant religion. The defeated Maxentius was drowned in the Tiber, and Constantine became one step closer to the status of the sole emperor of Rome. Thus, the era of Christianity began. Nowadays, close to the Mulvian bridge, the Stadio Olimpico, which holds domestic football games of Roma and Lazio clubs, is located. Ponte Sisto is a pedestrian crossing between the right bank of the Tiber and Trastevere. The medieval stone bridge, dedicated to Pope Sixtus IV, looks very beautifully in the background of the old quay. On the left bank, right across the bridge, there is Piazza Trulissa – a popular meeting place for residents of the capital and visitors of Trastevere. From July to August, the quay of the Tiber at Ponte Sisto is filled up with tents with snacks, cocktails and live music. Everybody is invited to look at local prices and plunge into the cozy atmosphere of the evening. To the south of the Vatican, on the river, there is a small island – Isola Tiberina, which looks like a fishing boat from bird’s-eye view. In the 10th century, The Basilica of St. Bartholomew on the Island (Italian: Basilica di San Bartolomeo all’Isola), where the tomb of San Bartolomeo is, was founded. 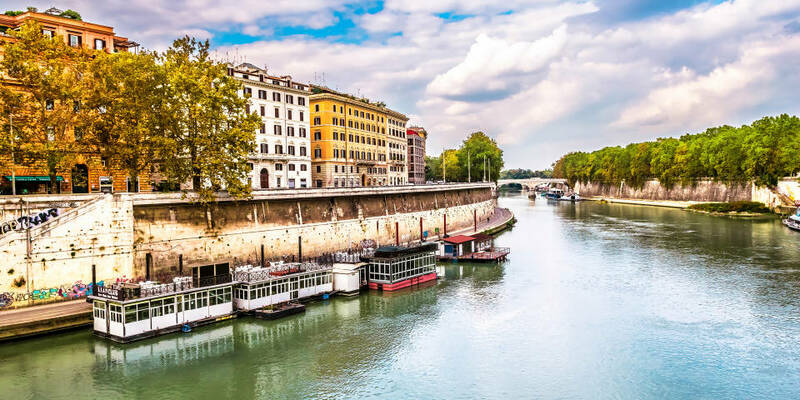 If you cross the Tiber across the island, then, on the right bank, one of the most amazing Roman sights – the Mouth of Truth (Italian: Bocca della Verita) – can be seen. Ponte Sant’Angelo (meaning the Bridge of Hadrian) dates back to the 2nd century AD. It is used only for a walk. In ancient times, the bridge was named after the Emperor Hadrian, because it was built on his command. The crossing leads to the Mausoleum of Hadrian, also known from the Middle Ages as Castel Sant’Angelo. The huge stone cylinder of the castle keeps the remains of the Christian pontiffs and many historic artifacts. In the 15-16th centuries, the bridge, faced with marble, was decorated with statues of Saints Peter and Paul. And in the 17th century, Giovanni Lorenzo Bernini completed the decor with 10 statues of angels.